Manebhanjan (or Mane Bhanjyang) is a small mountain township located about 26kms from Darjeeling, 92kms from Siliguri, and on the border of India and Nepal at an altitude of 7,054 ft (2,150 m). Bhanjayang in Nepali means Junction, and Mane stands for Buddhist Stupas. So the name Manebhanjan means the junction of Stupas. This is the place from where the popular Sandakphu Trek begins. The main economy here is based on trekking and tourism. Regular jeep safaris take place from here to the nearby areas including Sandakphu and the Singalila National Park. Manebhanjan is one place where you will still find the old 4-wheel drive Land Rovers that were once used during the British days. These vehicles are ideally suited to climb the steep gravel road that leads up to Sandakphu. Only 40 odd such Land Rovers are still remaining in this area and are maintained by their owners. The Land Rover Association now allows only these vehicles to ply along the Sandakphu route, although one can take his personal 4-wheel-drive vehicle too (with permission from the association). The main market area of Manebhanjan gets quite congested during the day time. Land Rover and taxi stands are located here. Taxis which are commercial vehicles like WagonR, Sumo etc are mainly meant for taking tourists out of Manebhanjan for transfers to NJP/Bagdogra or other places around Darjeeling. A playground is located a short distance away where soccer tournaments are held on special occasions. Up on the hills, there is a nice colorful monastery amongst pine trees. The market area is full of small shops, mainly grocery and stationery stores. There are also two medical stores in the market area. You can buy your essential items here and stock your provisions including mineral water, dry food etc. There is no proper restaurant in Manbhanjan, although there are couple of low grade eateries around in the market area. Most tourists and trekkers have their meals at the hotels or homestays where they put up. 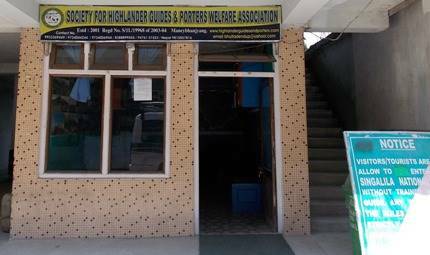 The Highlander Guides & Porters Welfare Association offers registered guides and porters to the trekkers. Their office is located shortly after entry to Manebhanjan and on the right. The booth of the Land Rovers association is located in the main market area and after the taxi stand. The office of the forest department that issues permits to Singalila National Park is located towards the end of Manebhanjan township and shortly before the uphill road starts. Permits are required by all going towards Sandakphu. It's an office with a large room which is also used for holding seminars by the Singalila Wildlife Division. There is a desk at one corner where the staff issues the permits. Note that regular Land Rover safaris are available from Manebhanjan to visit places like Tumling, Sandakphu and beyond to Phalut. Most of the road is now tarred (earlier the entire road used to be a boulder road and required nearly 4.5 hours to reach Sandakphu. Now vehicles can easily reach in 2.5 hours although a stretch of the road from Gairibas onwards is still a boulder road). Read: Exciting jeep safaris to Sadakphu and Phalut through Singalila National Park. From Darjeeling the distance to Manebhanjan is 26kms. The route goes via Ghoom and Sukhiapokhri. You can take a reserved taxi from Darjeeling Chowk bazaar or Gandhi Road (Club Side) Taxi stand and reach in about 1 hour 15 minutes via Sukhiapokhri. There are also regular shared jeeps and buses up to Sukhiapokhri. So alternatively you can come up to Sukhiapokhri (takes about one hour from Darjeeling) and then take an onward jeep up to Manebhanjan. From Sukhiapokhri, there is also a 4km trekking route up to Manbhanjan. So if you want to warm up, you can even take this short trek. The main route to Manebhanjan from NJP/Bagdogra is via Mirik, Pashupati Nath Market and Sukhiapokhri (takes about 4 hours by car). However if you take a reserved taxi from NJP or Bagdogra, 2kms before reaching Sukhiapokhri the driver will veer into a steep downhill narrow road on the left that meets at Manebhanjang bazaar area. This route is shorter. Alternatively you can come up to Ghum along Hill Cart Road, take a left turn towards Sukhiapokhri and then reach Manebhanjan (this route also takes similar time). Some times taxis come only up to Mirik, and then you need to change over to another one. Pre-paid taxi is not available from Bagdogra (or NJP) all the way up to Manebhanjan. A cheaper way of reaching Manebhanjan from NJP/Siliguri is to take a shared jeep up to Mirik or Sukhiapokhri, and then another shared jeep to Manebhanjan. But this takes much longer time as shared jeeps stop at many places, plus a break journey is involved. Shared transport is however not available from Bagdogra airport. Check out Darjeeling Transport & Fares to know about all the modes of transport available from Darjeeling for Manebhanjan and the fares. Some residents offer home stays in their private houses. One of the best home stays here is offered by Keshav Gurung, a courteous and friendly man. His 2-storied house is one of the best in the locality and is very conveniently located next to the jeep stand. The hospitality, cleanliness, basic amenities and the great food prepared by his wife are really special. Check out Home Stay in Manebhanjan to know about this home stay. While there are several small hotels, couple of them stand out from the rest for their popularity with trekkers and tourists. One is Hotel Exotika, and the other is Hotel Pradhan, both located in the main market area. Check out Hotels in Manebhanjan to know about them, their contact info, rates etc. In Sept 2018 we went to Manebhanjan from Darjeeling. Manebhanjan is a small town located in Darjeeling district with natural beauty along with beautiful landscapes. Reaching Manebhanjan from Darjeeling is very easy and convenient. 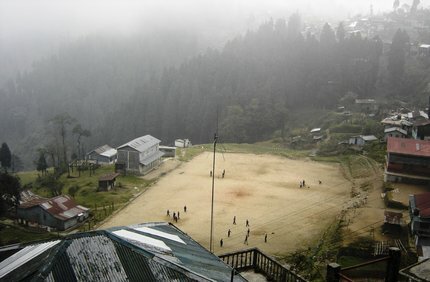 From Manebhanjhan you can go to various places like Mirik, Jhorpokhri, Tonglu, Tumling, Meghma, Sandakphu, Phalut. People here are very helpful and co-operative. And also you can get a glimpse of the old British era Land Rovers, which are present only in Manebhanjan in whole of India. Also this place is the gateway to Sigalila National Park which is full of rich flora and fauna and also home to the Red Pandas. 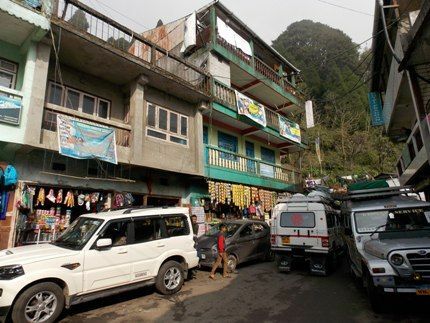 From Darjeeling Bus stand you can take a shared jeep towards Sukhia pohkri whose cost is Rs. 40 per person. On your way you will be travelling through Lepchajagat, you can get down and enjoy a bit and have tea/coffee here and roam about for about 30-40 minutes. If luck is on your side, on a clear day you can definitely get a great view of the majestic Kanchenjungha and also the Darjeeling town. Then from Lepchajagat take a shared jeep for Rs.10/15 per head and get down at Sukhia pokhri. From Sukhia phokri there are several Maruti Vans that operate in sharing basis and costs Rs.30 per person to Manebhanjan. From Manebhanjan stand you can go to any direction you desire (Jhorpokhri, Meghma, Tumling, Tonglu and even all the way to Sandakphu and Phalut). From Manebhanjan you will get Several English Style old Land Rovers which would take you to Tumling and Tonglu, and even Sandakphu/Phalut. But Sandakphu cannot be done in a day trip but Tumling and Tonglu as well as Meghma can be done in a day trip, the cost for which is Rs. 2000 per vehicle. We (Me and my brother, both age around 25) are planning to trek to Sandakphu. As per suggestions in your website, we will start trek from Maneybhanjan. The point is, we will be reaching Bagdogra on 25th April around 12:30pm. We plan to reach to Maneybhanjan on the same day(25th) so that we can start trekking for Sandakphu from early morning on the next day(26th). The questions are -> Is it possible to reach Maneybhanjan from Bagdogra by shared jeep/bus (no problem with break journey) if we start from Bagdogra around 12:30 PM afternoon. If yes, should we break our journey as follows --> Bagdogra -- Siliguri -- Mirk -- Maneybhanjan; or Bagdogra -- Siliguri -- Darjeeling -- Maneybhanjan. Hi, You can either take the Mirik route or via Ghum (no need to go all the way to Darjeeling if you take this route, instead get off at Ghum). From Mirik you should get a shared Jeep (may not be to Mnebhnajan, but up to Sukhia where you may need to take another one). This will be a longer route. On the other route you can break at Ghum and take a shared Jeep (you might again have to break at Sukhia if you do not get a direct one). However depending on your timings along the way, you are likely to land up in a situation where shared jeeps are no longer available at a place because they usually do not ply after 3pm on such routes. Note that shared jeeps are not available at Bagdogra airport. You need to go to Siliguri stand which itself will take about 30-40 minutes. Thank you Mr. Raj for your valued reply. Can you please inform me one more thing: Can we borrow tent for camping from Manebhanjan? If not, then from where we can borrow it ? You won't usually get camping tents on rent at Manebhanjan or anywhere in Darjeeling hills. For camping you should go through a trek operator who would organize the trek. I want to take my personal car upto Manebhanjyan during my Sandakphu Trek. I want to park my car in any kind of paid garage facility. Can you please suggest me any place likewise where I can stay for a night & park my car for 6 Days? Hello, there is no such facility in Manebhanjan to park your car for several nights. I intend to trek the Sandakpu trail in the end of December so I will need heavy precaution. Is their any way getting trekking equipements like rucksack, sleeping bag, heavy jackets at rent at Manebhanjan. I am from Kolkata but do not want to get it rented here and carry so far. You won't get all that in Manebhanjan.